For years my goal has been to complete a clean sweep in the CW ARRL Sweepstakes. A clean sweep is working all 80 sections in the US and Canada, which includes Alaska, Hawaii, Puerto Rico and the Virgin Islands. Several years I've been close with 78 or 79 sections, but I never managed to get the Northwest Territory in Canada. This year I was fighting high line noise, and wondered whether to even take part. But I started out and started getting some of the rare sections -- North Dakota, Wyoming, South Dakota -- right off, so I got hooked. The contest started at 4 p.m. local time, and by the time I went to bed at 1 a.m. I was close to 400 contacts and had 76 sections. I was missing Hawaii, Puerto Rico, Newfoundland and Northwest Territory. I had a great time last weekend working the Illinois QSO party. I wound up with about 375 contacts, and a good number of multipliers, so I should end up with a respectable final score. But what's more important, I had a great time doing it.Everything seemed to work -- I spent most of my time running frequencies (calling CQ and having people call me) on 40 and 20 cw, and when things were slow, I moved up to 40 SSB and did about 120 contacts, and picked up a bunch of new multipliers in counties that just weren't on CW. One of the highlights was having a European station call me on 40 cw at 3:30 in the afternoon. Working Europe at night on 40 is no big deal, but I've never worked Europe on 40 that time of day. In the end, I worked about 10 different Europeans on 20 and 40, which was nice and gave me six additional multipliers. The Illinois QSO party is always about three weeks before cw Sweepstakes, and gives me a good warm-up for it. I'm ready. My trusy Icom 765 is for sale on eham.net. Here's a better photo than you can see there. Contest season is starting up, so I'll be more active, and share more here on the blog. I added the Elecraft P3 Panadapter a couple weeks ago, and I've been happy with it. This weekend was the California QSO party, so I used it as a good chance to see if I have all the software and radios working together. So far, it is. I can even run the P3 Panadapter and the LP-Pan Panadapter on the computer at the same time, so I have band scope both on the computer and on the screen next to the radio. The attached video gives a quick demo. I've spent a lot of time trying to control the K3 from the iPad, and I'm so close I can taste it, but never have succeeded. I'm using an iPad App called Jump, that streams the audio back to the iPad, as well as controlling the remote computer. It works very well, except I can't get it to stream audio from the computer's sound card output. I know I'm missing a small setting somewhere, but I've been through every menu I can think of, and I haven't found it. I can stream other audio from the computer back to the iPad. I can hear the sounds, play a Youtube video, etc, and hear it on iPad. But I can't get the audio out from the sound card. I did have it running the other night where I controlled the radio with the iPad, and used Skype to send audio back to my iPhone, but then I'm using two devices. If the iPad would multi-task, I'd be there. I was doing my usual Saturday morning routine of tuning around 40 meters CW when I heard Zl7LH calling CQ. I replied, and worked him on the first call. ZL7 is Chatham Islands off the coast of New Zealand, not a bad Saturday morning QSO on 40, and a new country for me. That was a good way to start Saturday. Last night I had a good high-speed CW contact with Neal, N4HAF in Raleigh, NC. It's nice to get back on CW and get the CW muscles working again. Looking in the log a couple weeks ago, I realized I had nearly been off the air this summer. So I tried to get on the air for some simple cw QSOs a couple weekends ago, and it was nice to hear CW again.Last weekend I ran the North American QSO party for a few hours. I did a couple hundred contacts, mostly on 40. 80 meters was just too noisy to deal with. This weekend I messed with the Worked All Europe DX contest on Saturday night on 40. I could hear a few EU stations, between all the US stations calling CQ Test. I managed to squeak out 25 contacts on 40 meters last night, but that's less than an hour on good band. As the weather changes, I'll get more active on the radio and more active on the blog, I promise. This has been a slow summer for ham radio. I made a couple of contacts running mobile the last week on 40 CW, but really haven't been on the air in the past month. I even missed Field Day, for the first time in 10 years. A wedding of an old friend's daughter took precedence. Hopefully, I'll get back on the air the next month, and have some things to post about. I did pick up a software defined receiver at a Hamfest a couple weeks ago, but haven't gotten it out of the box to mess with yet. Stay tuned. My only purchase was another keyer, plus some odds and ends. More on that keyed and a couple other things when I get home. Ok, I got outside and worked on the STeppIR vertical this morning. As I suspected, the problem was with the coax connection to the antenna. As I kept trying different coax and radio combinations, suddenly everything worked again. In plugging and unplugging the coax and trying different combinations, I evidently cleaned the connector on the antenna. After it started working again, I went back and cleaned everything with Deoxit, and hopefully it will solve the problem. All I know is it's nice to have the vertical back. I did open the antenna, and will post some pictures shortly. 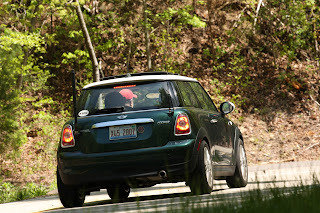 Took the Mini to Minis on the Dragon last weekend. Not much radio time, but did meet two other hams at the event. There were over 600 Mini Coopers there, by the way. Here's a nice shot of the car and antenna. I'm thinking of heading to Dayton next weekend. Not much radio time with all this travel.